Indigo Books & Music Inc. has announced that it is closing its Vancouver Robson Street flagship location on June 30. Victim of a “very significant rent increase made continued profitability untenable.” Indigo says it will open another location in the “same Vancouver trade area” this year, though an exact location has not been revealed. Chapters’ Vancouver flagship boasts approximately 50,000 square feet of space over three levels of retail, including a dramatic entrance with soaring ceilings. The ground floor features a Starbucks shop-in-store, while the second level features an 1,800 square foot licensed American Girl doll shop. The store’s third level features a wide open spaces with thousands of square feet. Indigo says that it will “temporarily transition the American Girl Specialty Boutique” located within. American Girl’s first Canadian location opened in Vancouver’s Chapters in May of 2014, along with a Toronto location at Indigo at Yorkdale Shopping Centre. Last October, the company decided to close its Montreal flagship at Saint Catherine Street West. The Robson Street store closure follows closely on the heels of recent announcements by other big retailers Target, Mexx and Sony. There is speculation that Japanese retailer Uniqlo will replace Chapters, however, nothing has been confirmed. At this time, there are no plans to close the Chapters Books location on South Granville at the intersection of Granville Street and Broadway. Within the region, there are also other locations at Metropolis at Metrotown, Lougheed Mall, Surrey’s Strawberry Hill, Coquitlam’s Pinetree Village and Langley. Major store closing discounts are unlikely for the Robson Street location. Most of the inventory will likely be sent back to the distribution centres, the supply centres for Indigo’s online store, and other Chapters locations. This article by Helen Siwak was originally published in VancityBuzz.com. 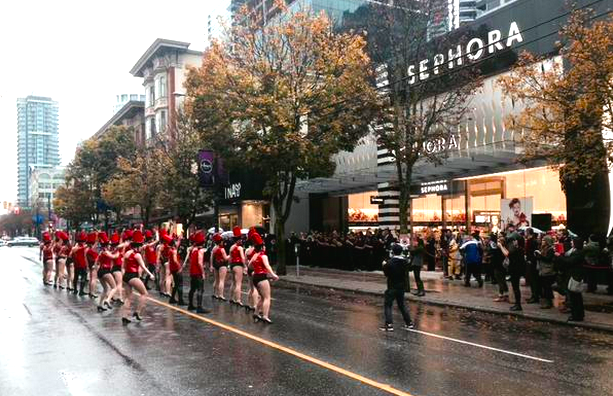 Canada’s largest location for French cosmetics retailer Sephora has opened on Vancouver’s Robson Street. The two-level store is now considered to be the retailer’s Canadian flagship. It features several Canadian exclusives, as well as a first in the world for Sephora – a unique skin care studio concept. Located at 1045 Robson Street, Vancouver’s Sephora flagship measures about 9,500 square feet, including about 8,600 square feet of retail space. 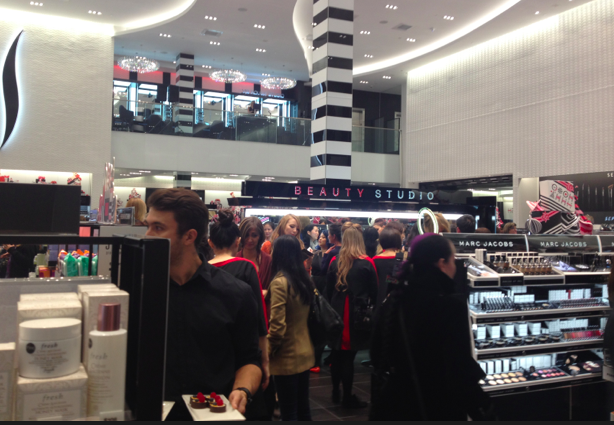 Sephora’s Pacific Centre location, as a comparison, measures 5,935 square feet. 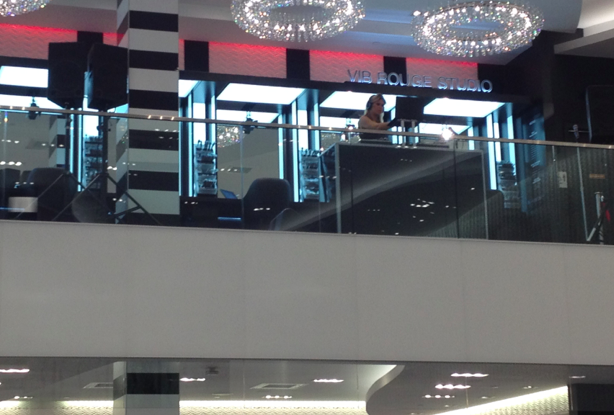 The world’s first VIP Rouge studio, located on the store’s 2nd floor mezzanine, allows ‘Sephora Beauty Insider’ Rouge clients free access to beauty and skin care studio services in a separate, private space. 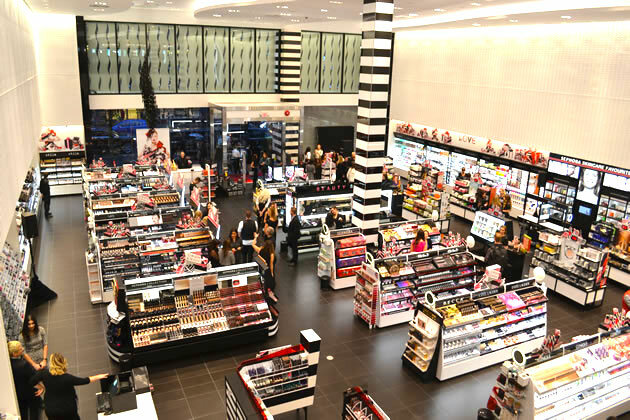 Sephora Robson Street features more than 200 colour, skincare, fragrance and haircare brands, including services only available at this store. Canadian brand exclusives include Chloe, D&G, Ole Henrickson, Marc Jacobs Beauty, Bare Minerals, Fresh, Kat Von D Beauty, Glamglow, Hourglass, Boscia, Atelier Cologne and more. First-to-market services include a cologne engraving machine, a Benefit Brow Bar, a Bumble and bumble Hair Studio, and Sephora Skincare studio. 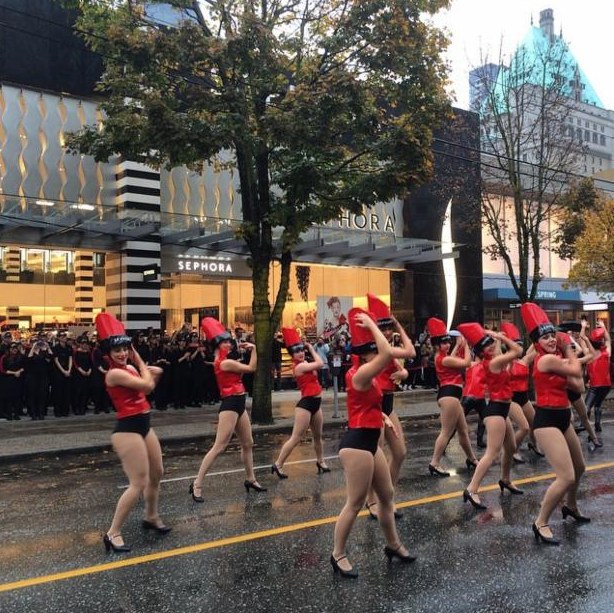 Dancing lipstick dispensers at Sephora Robson Street’s grand opening. Photo: Robson Street BIA | Twitter. At its media launch on Thursday, October 30, invitation-only guests were given a postcard of services and were encouraged to visit various store displays and have their cards punched. Upon departure all received a swag bag with full size products, samples and special coupons within a re-usable Sephora branded bag and a chic Vancouver-themed Sephora umbrella. Supermodel Coco Rocha at the opening | Sephora. Canadian supermodel Coco Rocha was a surprise special guest. Rocha was in Vancouver to release her first book ‘The Study of Pose’ at Holt Renfrew on Granville Street. The book is an exploration into the human form that features 26 year old Rocha in 1000 unique poses shot by photographer Steven Sebring. 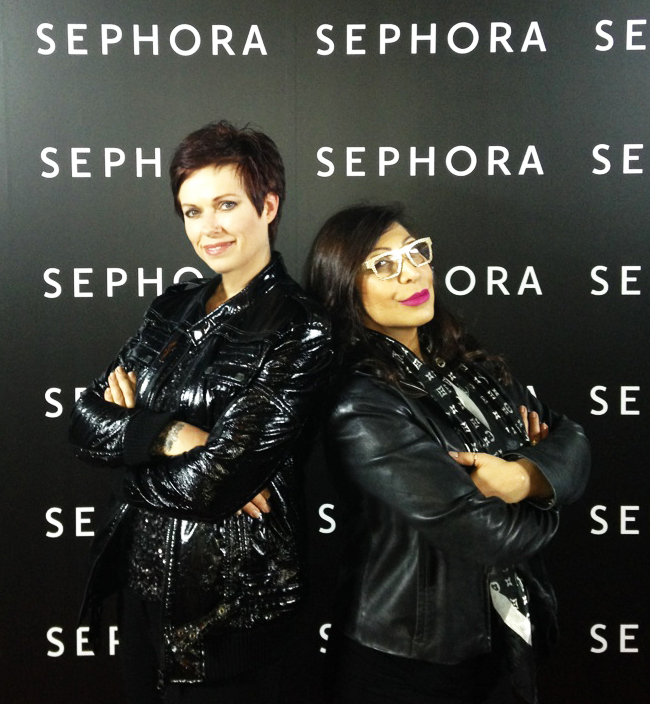 “We are very excited for the official opening of Sephora – it has been long awaited. The store itself is beautiful and well thought out. It will be a spectacular addition to the street,” said Teri Smith, Executive Director of the Robson Street Business Association, a week prior to the store’s opening. The first Canadian location opened in 2004 at the Toronto Eaton Centre. The original 5,200 square foot location was replaced in November of 2012, creating a store in excess of 8,900 square feet. The company is a Paris-based chain of cosmetics stores. It was founded in 1970 and purchased by the LVMH conglomerate in 1997. It has locations worldwide and opened its first North American store in New York City in 1998. It carries over 100 brands as well as its own private label products and includes makeup, skincare, fragrance, hair care, bath and body products and hair and make-up tools.